Arm & Hammer coupon is a coupon that you can print off yourself. Visit Smartsource.ca’s website, select the Arm & Hammer toothpaste coupon and download the coupon printing software. You can bring your printed coupon directly to the store and save money on your toothpaste. 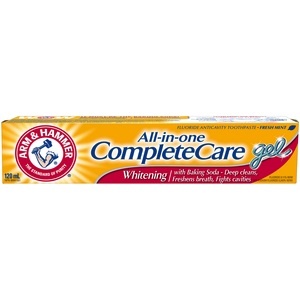 Arm & Hammer coupon is to save $1 off any Arm & Hammer Toothpaste. ARM & HAMMER™ Advance White™ Extreme Whitening is specially formulated with Baking Soda and Peroxide to give you a noticeably whiter, brighter smile. The Baking Soda gently removes plaque and surface stains with a deep cleaning action, while high levels of Peroxide target tough, set-in stains with extra whitening power. Plus, Stain Defense™ technology actually helps to prevent new stains from setting. It’s the secret to a whiter, brighter smile.